Drain your tinned peaches/apricots (discarding the syrup) and blitz the fruit in a food processor until smooth. Pour this into a large mixing bowl and add the rest of the ingredients. Stir well and add your chicken wings. Allow your chicken wings to marinade overnight or for as long as possible. Pre-heat your oven to 180 degrees (Celsius). 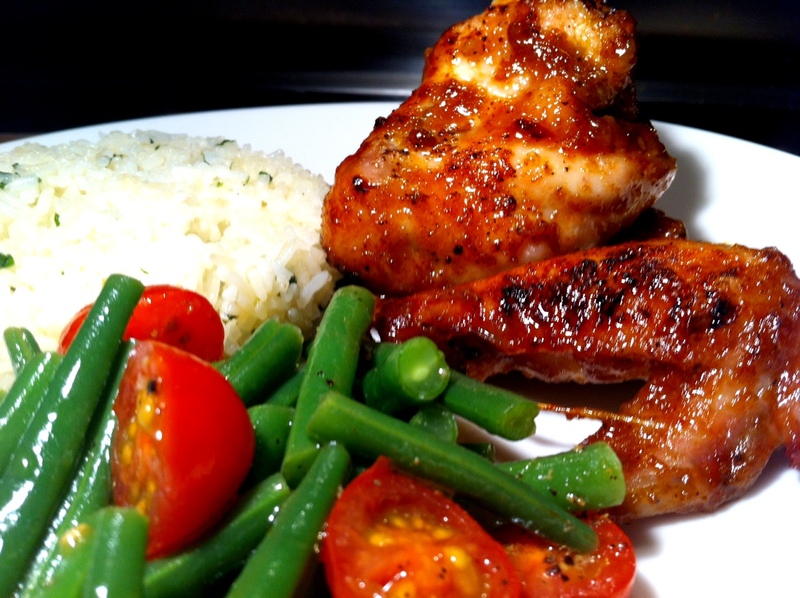 Place your chicken wings on a baking tray and spoon 5-6 tablespoons of marinade over the tops of the chicken wings. Cover the tray with silver foil and roast in the oven for 20 minutes. Remove the silver foil, baste your wings (pour more of the marinade over them) and roast for another 20 minutes, turning them over and re-basting them every 5 minutes. Just before the last 5 minutes of roasting, drizzle some runny honey over the chicken wings as the honey will burn slightly under the heat, creating those lovely bits of charred yummy chicken.